Hey! Playmobil has some new Micro World releases this year. They now have the Modern House available in this tiny scale. I had to buy that. I usually buy these pieces to use as modern toys inside my dollhouses. You can see the Noah's Ark in the modern nursery here. I've been hoping for a long time that someone would make a 144th scale version of the Kaleidoscope House. I had even anticipated it being an accessory back when the house was being produced by Bozart Toys. I think it would be so very cool to have that sitting inside the 1:12 structure. Sigh. The Kaleidoscope Dollhouse for the Kaleidoscope Dollhouse is a great idea. It probably wouldn't be to hard to make. I'm actually thinking about making one. I'll let you know how it goes, if you're interested. Of course I'm interested! I'm sure several others would be too. Oh, this is adorable. I haven't done a nursery room yet, but this might inspire me. Ok, I'll let you know when it's finished, and I will post some pictures on my blog. 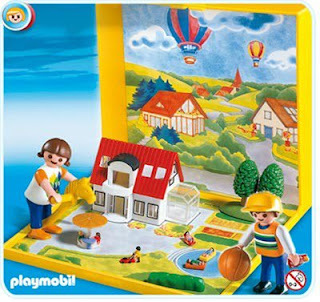 One fantasy my kids and I agree on is replacing the real living room and dining room furniture with everything modern in the Playmobil catalogue for a whole Playmobil world. They're excited about putting the grocery store here, airport and train station, zoo... there, while I'm furnishing the house in my mind. Mostly modern, but judicious use of the victorian and fairytale collection. And why not toss in some columns from the Roman theme? It's now dawning on me that I have too much information on this topic. Happy Sunday! WOW!! I'm so glad I finally found someone that is into Modern Minis!! Wish you had seen my face when I saw some of your pics, LOVE it! I'm glad i'm not the only maniac in this world, LOL!!! Thanks! There's quite a big bunch of us who dig the modern minis.